Basically I thought it'd be good to share the various locally produced products that I use here in Oman. Perhaps you can suggest better alternatives, or perhaps you'll try one of the products I like and mention here, I don't know - but none of these will be paid advertisements. 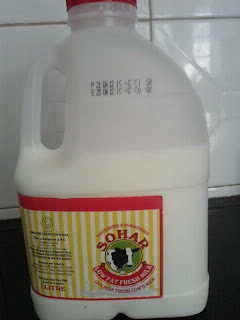 So here's my first product: Sohar Milk. I have it on my Weetabix! I honestly only very recently discovered this milk, after years of using Al Marai milk products I finally took the time to read the label and discovered that Al Marai products are made in the KSA! Not that I have anything against the Kingdom, I just don't think that milk produced there can be particularly fresh if I buy it here in Oman. Which is when a few months ago I started looking for a local Omani alternative and discovered Sohar Milk. A google search tells me that Sohar milk is a product from the typically named Oman Agriculture Development Company SAOC - an Omzest company. Now, the dairy scene here in Muscat is very much dominated by the KSA imported Al Marai, but I honestly prefer the Sohar milk and am glad I tried it out - to me it tastes fresher. The price is the same as Al Marai and it's available in all the major supermarkets, and even some Oman Oil shops. As I understand it (which means I could be wrong) Oman doesn't produce it's own milk because it doesn't have the cows to do so whereas Soodi has the largest herd of cattle in the world. Is Sohar milk produced here is it rehydrated here? Drinking Sohar Milk for 6 years now! Dairy has about 3000 Heads of Holstein-Fresian cattle under intensive Management. Breeding is by Artificial Insemination to facilitate animals of better genetic stock. Milking is carried out in a fully automated Milking Parlour thrice a day. In addition to Fresh Milk, Yoghurt, Laban, Desserts, and Fresh Fruit Juices are produced and distributed throughout the Sultanate. A Processing Plant with capacity to produce 30,000 ltrs of fresh milk & milk products. It manufactures Dairy Products under the Sohar, Sunfarms and Moo Cow Brands. But does it say that the Sohar dairy is in Oman? They may have a dairy in Saudi. "The farm is located at Sohar, 235 kms north of Muscat, and occupies an area of 800 hectares. The current activities of the farm involve production of Fresh Milk, Yoghurt, Laban, Fresh Juices utilizing modern technologies of production. Agriculture area (developed land) comprises of 500 hectares, irrigated by 9 Center Pivots and Drip Irrigation System for the production of Green fodder throughout the year". I stand corrected and happily so. you could also try al Safwah Dairy products from Salalah including Milk (Laban etc etc). If you really want to go up-market and are in Salalah - get up bright and early and join the folks buying Milk from the royal farm. Are you able to buy locally produced, certified organic milk in Oman? Also, if one eats all organic foods, are they readily available? I use Sohar Milk because it is as good as any other brand available in Oman and also because it is an Omani product.My children are proof enough for the quality!There are also some other products manufactured or produced in Oman, which are also good.I try to use them whenever possible even though I am an expat. Used Al Marai when we first moved to Oman, one of the bottles went bad in three days leading us to believe that it's not as fresh or is pasteurized wrongly. Switched to Al Rawabi ever since. When we first came to Oman in the 1980s, the only fresh milk available was Sunfarms milk, which came from cows kept up at Sohar. A friend of mine went there, and said that the black and white cows were kept under shading, on concrete floors and had foot problems as a result. You used to be able to see the cows when you drove past Sohar, near where the royal palace is. Not sure if Sohar milk is the successor to Sunfarms or not. Anyway, we drink Al Marai through habit and I like the 1l bottle shape. I buy Al Rawabi if there's no Al Marai and dont notice any difference. When I buy it at Al Fair (MQ or Sarooj), I find it is pretty indestructable. I take a small 200ml bottle of Al Maria on wadi trips, and leave it in the door pocket (for my coffee - hubby likes his black so we take a thermos of black coffee and I add my milk) and it usually stays fine all day in the heat, and is still fine the next morning for my breakfast tea. So goodness only knows what they do to the stuff. Just glad that I dont have to drink powdered milk as I hate the backtaste that it gives. The slogan launched on the auspicious world milk day by OADC's CEO Mr.Alabh Sinha and Chairman Mr. Abdulla Zaharan was" Good Morning begin with Sohar Fresh Milk"
I buy Sohar Milk for my kids since i moved from dubai to Muscat last year. The milk from the closest farm is obviously fresh & the best. i have investigated & found out that the milk is produced in Sohar. You can feel the richness in taste. I get a guy who delivers farm fresh milk from Mabela in Muscat. Love it! It comes in 1.5 ltr bottles (empty bottled water bottles are used for this purpose). At the farm you can buy it at 800 baizas, but he charges 1.2 OMR for the same. I don't mind paying the prize. My toddler and I are quite sensitive to Almarai and Al Rawabi, but this is just right for us. U can call him on 9779 2323. His name is Rizwan.